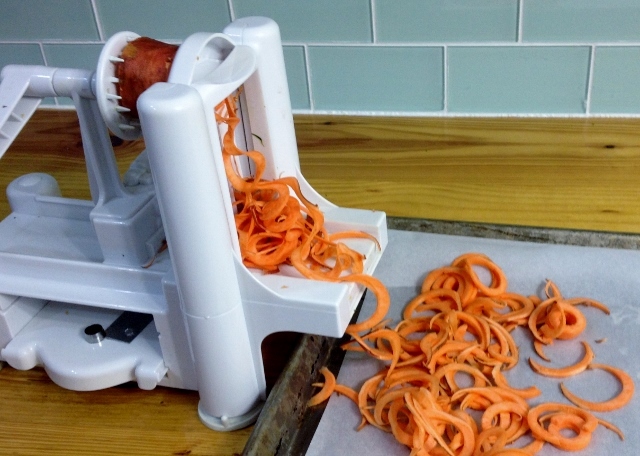 I use my Spiralizer (aka The Noodler) several times a week. 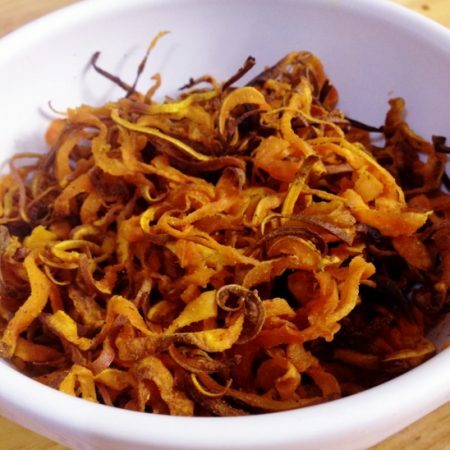 While most often it is to make some sort of noodle with a vegetable, I like using it to create lots of side dishes, including these Curried Shoestring Sweet Potatoes. If you are using the Paderno spiral slicer to make this dish, I use the larger of the noodle blades. (Not the flat, ribbon blade.) While the sweet potatoes may look pretty thick when you cut them, they cook into thin, crunchy shoestrings. If you enjoy a fancy little garnish atop a dish, use the smaller of the blades. A little nest of them perched atop a meatless meatloaf is darling. Keep a really close eye on the thinly cut ones while baking, as they will burn in the blink of an eye. Not a fan of the heat of curry powder? These are also good with Garam Masala, which is technically a curry powder but has a much milder flavor. It usually contains cardamom, cinnamon, cloves, cumin, peppercorns and coriander. Still wonderful warming spices, but without the heat of high capsaicin spices. I’m a big fan of Garam Masala on baked sweet potatoes. 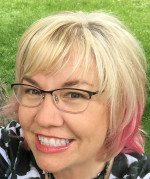 Looking for additional recipes to use The Noodler? 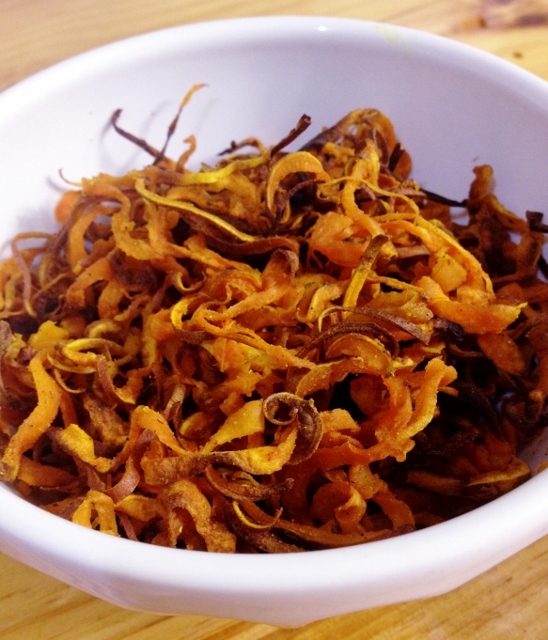 I’ve got a round-up of my favorite Spiralizer recipes here. Preheat oven to 400 degrees. Line large baking sheeting with parchment paper. Once they are all sliced, drizzle with healthy oil of your choice. Then sprinkle with curry powder. Using tongs, toss well to coat the sweet potatoes with oil and curry powder. Place in oven for 10 minutes. After 10 minutes, toss the potatoes. Return to oven for another 10 minutes. At this point, you may decide the potatoes are done OR you may return them to the oven for additional time. The amount of time they bake will depend on how thick the potatoes are sliced and how crispy you would like them. Serve with a side of Sriracha Honey Ketchup. I enjoy these with a side of Sriracha Honey Ketchup. 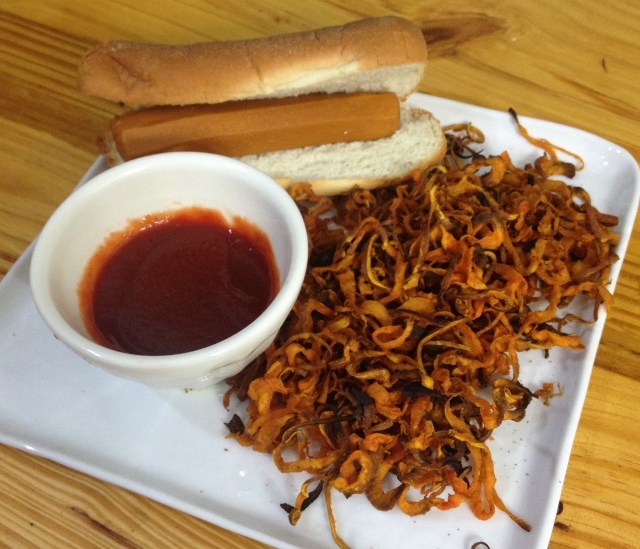 Come back on Monday, I’ll share the ketchup recipe Here’s the recipe! 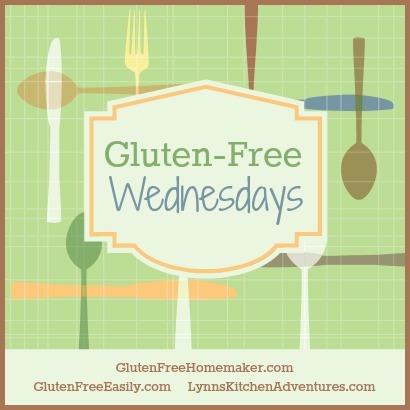 I’m linking up with Gluten-Free Wednesdays. Click over to see SO many wonderful recipes from bloggers you know and trust!